The political strength of Henry VIII's regime lay in his ability to choose advisors who were both wise and learned. One of these men was Sir Brian Tuke. As Master of the Posts, he organized and established England's postal service. In 1528 Sir Brian was appointed treasurer and secretary of the royal household, a position he held until his death in 1545. He was also admired as an eloquent speaker and literary figure who authored a preface to an edition of Chaucer. The portrait, which shows Tuke at the age of 57, exemplifies the qualities most praised in Holbein's work: precise observation of detail and impartial, accurate portrayal of the face. Yet the image is also tinged with gentle sorrow. On the table beneath Tuke's left hand is a folded paper bearing a quotation from the Book of Job (10:20) which begins, "Are not my days few?" The gravity of the sentiment is echoed in Tuke's countenance; his faint smile is pained and his eyes, fixed but not focused, seem melancholy. Probably Sir Paul Methuen [1672-1757], London; by inheritance to his cousin and godson, Paul Methuen [1723-1795], Corsham Court, Wiltshire; by inheritance to his son, Paul Cobb Methuen [1752-1816], Corsham Court; by inheritance to his son, Paul Methuen, 1st baron Methuen [1779-1849], Corsham Court. Richard Sanderson, London and Edinburgh; (sale, Christie's, London, 17 June 1848, no. 7); possibly to Seguier(? ), London. Richard Grosvenor [d. 1869], 2nd marquis of Westminster, Eaton Hall, Cheshire, by 1867; probably by inheritance 1869 to his daughter, Lady Theodora Guest, Inwood, Somerset, until 1913; (Robert Langton Douglas, London), 1913, held jointly with (P. & D. Colnaghi, Ltd., London); sold 20 May 1913 to (M. Knoedler & Co., London and New York); sold April 1914 to Watson B. Dickerman [d. 1923], New York; his widow, Mrs. Watson B. Dickerman, New York, probably 1923-1929/1930; consigned 1929 to (M. Knoedler & Co., New York); purchased April 1930 by Andrew W. Mellon, Pittsburgh and Washington, D.C.; deeded 30 March 1932 to The A.W. Mellon Educational and Charitable Trust, Pittsburgh; gift 1937 to NGA. The first published reference to the painting is Johann David Passavant, Tour of a German Artist in England, 2 vols., London, 1836: 2:87. For the history of the collection see Corsham Court, Wiltshire, 1983: 23-31. There is no way of knowing if the portrait of Sir Brian Tuke belonging to Robert Sidney, Lord Lisle, and seen by John Evelyn on 27 August 1678, is the Gallery's panel or another version, although this is sometimes given as part of the provenance; see E.S. de Beer, ed., The Diary of John Evelyn, 6 vols., Oxford, 1955: 4, 143. The copy of the Christie's sale catalogue of the Sanderson collection in the possession of the Provenance Index of the Getty Art History Information Program, Santa Monica, has a hand written inscription in the margin, of "Seguier" or possibly "Leguin". Martha Hepworth's letter of 2 August 1988 to Susan E. Davis, in NGA curaorial files, notes that this is a later annotation by Frank Simpson, Librarian at the Barber Institute. The person has not been identified; William Seguier, the dealer, restorer, and first Keeper of the National Gallery, London, died in 1843. Ralph Nicholson Wornum, Some Account of the Life and Works of Hans Holbein, Painter, of Augsburg, London, 1867: 294, is the first mention of the painting as being in the possession of the Marquis of Westminster, but notes that it was brought for the Marquis at the Sanderson sale of 1848. This is not independently verified, but if so, then the name in the margin of the catalogue could refer to the agent. Denys Sutton, "Robert Langton Douglas. Part III." Apollo 109 (1979): 423-425, and the Getty Provenance Index. Douglas' letter of 6 May 1913 to Johnson is in the Archive of the John G. Johnson Collection, Philadelphia Museum of Art; see Lawrence W. Nichols, letter of 29 March 1990 to John Hand, in NGA curatorial files. See also letter from Douglas to Fowles dated 1 May 1941, Duveen Brothers Records, Box 244 (reel 299). Nancy C. Little, Librarian, M. Knoedler & Co., letter of 4 December 1978 to John Hand, in NGA curatorial files, states that the painting was purchased from Colnaghi's on 20 May 1913 and sold to W.B. Dickerman in April 1914. Nancy C. Little, letter of 4 December 1978, cited in note 5. Third Special Exhibition of National Portraits, South Kensington Museum, London, 1868, no. 625. Exhibition of Works by the Old Masters and by Deceased Masters of the British School, Royal Academy, London, 1880, no. 188. Exhibition Illustrative of Early English Portraiture, Burlington Fine Arts Club, London, 1909, no. 43. Loan Exhibition of Masterpieces by Old and Modern Painters, M. Knoedler & Co., New York, 1915, no. 4. Holbein in England, Tate Britain, London, 2006-2007, no. 141, repro. The painting is composed of two boards with vertical grain. The panel has been thinned very slightly; this is indicated by the presence on the reverse, at the upper right, of a red resinous seal that sits about 2mm above the surface of the panel. The picture has been cradled. Peter Klein's dendrochronological examination indicated that the wood was from the Baltic/Polish region and provided felling dates of 1525 +4/-2 and 1530 +4/-2 for the two boards. Examination with infrared reflectography did not disclose underdrawing. While there are no major alterations, infrared reflectography and x-radiography indicated very minor alterations in the outline of the figure, such as the reduction in size of the outer edge of the left elbow and changes in the position of the thumb. In general the painting is in very good condition. There are two checks at the left. There is retouching along the left and right edges and scattered retouching in the face and hands. The painting exhibits an unusual craquelure pattern with localized areas of wide drying cracks. Also on the reverse is a paper sticker that reads: 93007D/40 x 56/Knoedler/pour ce soir/5 heures. Peter Klein, examination report, 3 December 1986, and letter to the author, 28 March 1990, in NGA curatorial files. Passavant, Johann David. Tour of a German Artist in England. Translated by Elizabeth Eastlake. 2 vols. London, 1836: 2:87. Waagen, Gustav Friedrich. Kunstwerke und Künstler in England und Paris. 3 vols. Berlin, 1837-1839: 2(1838):304-305. Waagen, Gustav Friedrich. Works of Art and Artists in England. 3 vols. Translated by H. E. Lloyd. London, 1838: 3:93-94. Wornum, Ralph Nicholson. Some Account of the Life and Works of Hans Holbein, Painter, of Augsburg. London, 1867: 294-295. T.H.D. "Holbein's Portrait of Sir Brian Tuke." The Athenaeum no. 2186 (18 September, 1869): 376. Woltmann, Alfred. Holbein and his Time. London, 1872: 315-317. Walpole, Horace. Anecdotes of Painting in England; with some Account of the Principal Artists. 3 vols. London, 1876: 1:82. Crowe, J. A., ed. Handbook of Painting. The German, Flemish, and Dutch Schools. Based on the Handbook of Kugler. 2 vols. London, 1879: 1:208-209. 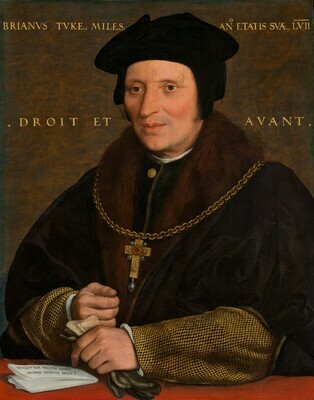 Davies, Gerald S. Hans Holbein the Younger. London, 1903: 219. Schmid, Heinrich Alfred. "Holbein, Hans, d. J." In Thieme-Becker. 37 vols. Leipzig, 1907-1950: 17(1924):352. Fry, Roger E. "Early English Portraiture at the Burlington Fine Arts Club." The Burlington Magazine 15 (1909): 74. Cust, Lionel. "A Portrait of Queen Catherine Howard, by Hans Holbein the Younger." The Burlington Magazine 17 (1910): 194. Ganz, Paul. Hans Holbein d.J. : des Meisters Gemälde in 252 Abbildungen. (Klassiker der Kunst, vol. 20) Stuttgart and Leipzig, 1912: 20:79, 238, repro. Chamberlain, Arthur B. Hans Holbein the Younger. 2 vols. London, 1913: 1:299, 331-333, 337, repro. Tatlock, Robert Rattray. "Sir Bryan Tuke, by Holbein." The Burlington Magazine 42, no 142 (May 1923): 246, 251, repro. Vaughan, Malcolm. "Holbein Portraits in America." International Studio 88 (1927): 23, 25, repro. Kuhn, Charles L. A Catalogue of German Paintings of the Middle Ages and Renaissance in American Collections. Cambridge, Mass., 1936: 79-80, no. 351. Cortissoz, Royal. An Introduction to the Mellon Collection. Boston, 1937: 43. Preliminary Catalogue of Paintings and Sculpture. National Gallery of Art, Washington, 1941: 99, no. 65. National Gallery of Art, Smithsonian Institution. Book of Illustrations. Washington, 1942: 38, 240, fig. 65. Schmid, Heinrich Alfred. Hans Holbein der Jüngere. Sein Aufstieg zur Meisterschaft und sein Englischer Stil. 3 vols., 1945-1948. Basel, 1948: 2:386. Paintings and Sculpture from the Mellon Collection. National Gallery of Art, Washington, 1949 (reprinted 1953 and 1958): 63, repro. Christoffel, Ulrich. Hans Holbein d.J. Berlin, 1950: 38. Cairns, Huntington, and John Walker, eds., Great Paintings from the National Gallery of Art. New York, 1952: 92, color repro. Evelyn, John. "Kalendarium 1673-1689." In Diary of John Evelyn, edited by E.S. de Beer. 6 vols. Oxford, 1955: 4:141, 143. Frankfurter, Alfred. "Midas on Parnassus." Art News Annual no. 28 (1959): 53, repro. Broadley Hugh T. German Painting in the National Gallery of Art (Booklet no. 9 in Ten Schools of Painting in the National Gallery of Art, Washington, DC). Washington, 1960: 10-11, 38-39, color repro. Walker, John. National Gallery of Art, Washington, D.C. New York, 1963 (reprinted 1964 in French, German, and Spanish): 122, repro. 123. Summary Catalogue of European Paintings and Sculpture. National Gallery of Art, Washington, 1965: 69. Cairns, Huntington, and John Walker, eds. A Pageant of Painting from the National Gallery of Art. 2 vols. New York, 1966: 1:118, color repro. Christensen, Erwin O. A Guide to Art Museums in the United States. New York, 1968: 131, no. 282, repro. Cuttler, Charles D. Northern Painting, from Pucelle to Bruegel: Fourteenth, Fifteenth, and Sixteenth Centuries. New York, 1968: 411, fig. 551. European Paintings and Sculpture: Illustrations (Companion to the Summary Catalogue, 1965). Washington, 1968: 60, no. 65, repro. Salvini, Roberto and Hans Werner Grohn. L'opera pittorica completa di Holbein il Giovane. Milan, 1971: 107, no. 120, repro. European Paintings: An Illustrated Summary Catalogue. National Gallery of Art, Washington, 1975: 178, 179, no. 65, repro. Walker, John. National Gallery of Art, Washington. New York, 1975: 156, no. 174, repro. 157. Sutton, Denys. "Robert Langton Douglas. Part III: Agent for the Metropolita Museum." Apollo 109, no. 208 (June 1979): 423, 425, fig. 34; 427 nt. 17. Hand, John Oliver. "The Portrait of Sir Brian Tuke by Hans Holbein the Younger." Studies in the History of Art 9 (1980): 33-49, fig. 2, 7. Sutton, Denys. "British Collecting, I. Early Patrons and Collectors." Apollo 114, no. 237 (November 1981): 284, 286, fig. 5. Fletcher, John and Margaret Cholmondeley Tapper. "Hans Holbein the Younger at Antwerp and in England, 1526-28." Apollo 117, no. 252 (February 1983): 93. Walker, John. National Gallery of Art, Washington. Rev. ed. New York, 1984: 156, no. 168, color repro. Rowlands, John. Holbein. The Paintings of Hans Holbein the Younger. Complete Edition. Oxford, 1985: 144-145, no. 64, pl. 102. Rowlands, John. The Age of Dürer and Holbein. German Drawings 1400-1550. Exh. cat. British Museum. London, 1988: 238, under no. 206. Goodwin, Jack C. "n to Ally-Pally: Stemp World London 90 to Be Held at Alexandra Palace." The American Philatelist 103, no. 12 (December 1989): 1145, fig. Howard, Maurice and Nigel Llewellyn. "Painting and Imagery." The Cambridge Guide to the Arts in Britain, edited by Boris Ford. 9 vols. (Vol. 3: Renaissance and Reformation.) Cambridge, 1989: 3:230, repro. 231. Hand, John Oliver. "Research on the Collections." Circle Bulletin No. 8 (Fall 1991): 3 p., unpaginated. Cherry, John. "The Milton Keynes Medieval Gold Cross." Minerva 3, no. 2 (May/June 1992): 35, fig. National Gallery of Art. National Gallery of Art, Washington. New York, 1992: 65, repro. Hand, John Oliver, with the assistance of Sally E. Mansfield. German Paintings of the Fifteenth through Seventeenth Centuries. The Collections of the National Gallery of Art Systematic Catalogue. Washington, 1993: 91-97, color repro. 93. Russell, Stella Pandell. Art in the World 4th ed. Fort Worth, 1993: 321, fig. 13.22. Bätschmann, Oskar, and Pascal Griener. Hans Holbein. Translated from German by Cecilia Hurley and Pascal Griener. London, 1997: 176-177, 180, color fig. 235. Klinger, D. M. and Antje Hötter. Die Malerbrüder Ambrosius und Hans d.J. Holbein: Werkverzeichnis, Gemälde und Miniaturen. Nürnberg, 1998: 202-203, no. 67, repro. North, John. The Ambassadors’ Secret: Holbein and the World of the Renaissance. London, 2002: 320, nt. 304. Foister, Susan. Holbein and England. New Haven, 2004: 42, 241, fig. 241. Hand, John Oliver. National Gallery of Art: Master Paintings from the Collection. Washington and New York, 2004: 150-151, no. 115, color repro. Sander, Jochen. Hans Holbein D.J. Tafelmaler in Basel 1515-1532. Munich, 2005: 311 nt. 178, 347, nt. 16. Bätschmann, Oskar, and Pascal Griener. Hans Holbein. Rev. and expanded second edition. Translated from German by Cecilia Hurley and Pascal Griener. London, 2014: 250, 252, color fig. 248.